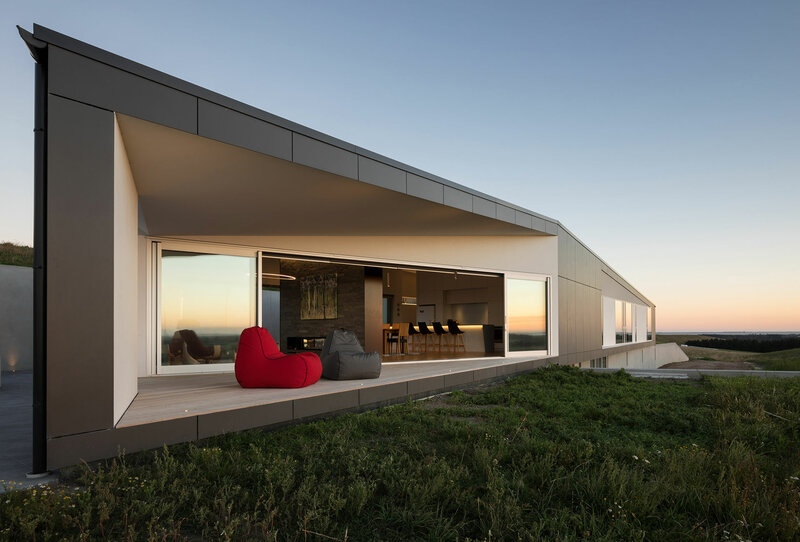 Designing a new build house on the rolling hills of Tai Tapu, on the foothills of the Port Hills outside of Christchurch, was a bit of homecoming for both Andrew Watson and his clients. The empty nest couple were returning to their home province after years in Australia, so wanted a year-round house for themselves (they work remotely) with room for visitors. And Andrew’s parents lived in the area, so he knew it well. The solution was to bunker the house into the landscape so that the wind rolls over the top. The long skinny building faces west, giving living rooms at one end northern sun, while the master bedroom is tucked in and protected at the south end. Andrew dug a lower garage and entry level into the contour of the land, so that the house appears to disappear into the surrounding hills. On the upper living floor, he excavated a sheltered courtyard into the eastern side, a serene outside space protected from the nor’westers. In this southern climate, opening up to east and western sun give better protection than due north. 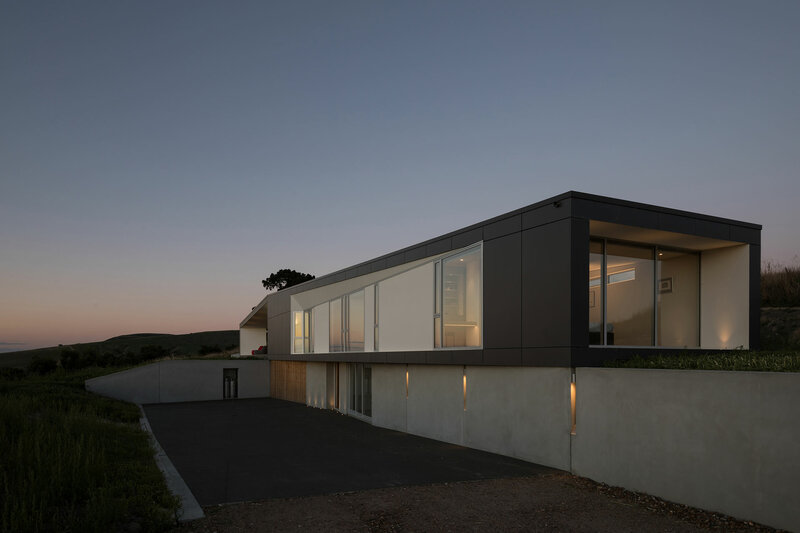 The house is hyper-insulated, with double glazing, solar blinds and venting windows on the south to control air flow in the extremes of winter and summer so that it ‘breathes in the heat”. The house’s sculptural form is highlighted by the materials: a slick black wedge of Swiss Pearl panels against monolithic natural plaster in white. Both the entry driveway and upper courtyard are finished with more of the plaster while timber decking and raw, minimal planting for the landscaping is intended to merge the house with the natural grass. The gallery hallway to the bedrooms is tucked into the shelter of the hill, with high windows to bring in natural light. The look of the house is Scandinavian, with white walls and pale oak floor, so the fireplace wall was about creating a sense of drama while separating the living and dining rooms. In contrast to another wall of bookshelves, the fireplace is in a black insert of stone, framed by black steel on each end. The Escea DX1500 double sided gas fireplace has vents and framed boxes in more of the steel to continue the raw aesthetic. Cleverly, a painting on one wall hides the access vents for fans and motors, the essential bits that force the warmed air around the house. Careful lighting design by Jane Purdue is a big part of the drama. Andrew points out that 80% of the warmth is created by the vents, the ambience of the flame more for cosy appearance. “Its open but visually connected. It gives the sense of a bit more nooks and crannies,” says Andrew.